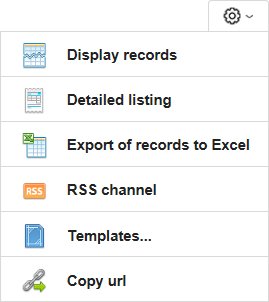 One of new features that ObjectGears version 1.5.0 is bringing are record templates. Each user can save record setting that occurs again and later on bring this setting back when filling in a new record. Users can have in each class as many templates as they find useful. Templates can be seen only by user that created them and by IT owner of the model with exception of global templates that IT owner sets to be used also by other users. Single template brings then higher productivity to whole teams. Each template can be modified. Particular items that the template sets can be deleted or changed. filling in values for various configuration item types (e.g. servers). 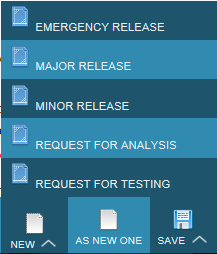 Available templates can be found on the button New and in Functions for page List of records. 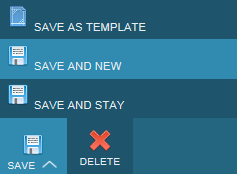 New template can be created by openning record detail and clicking on Save - Save as template. Templates are an effective alternative to buttons that we can place on toolbar when designing the solution and that also can take care of filling in values. Advantage of templates consists in the fact that templates are available to all the users without having to make change in the solution.